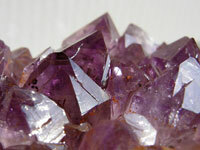 Ontario's official gemstone, amethyst, is one of the many natural resources found on the north shore of Lake Superior. The violet-coloured semiprecious stones native to this area come in beautiful shades, like Precious Purple and Thunder Bay Lavender. Visitors can mine their own at the Panorama Mine, 35 miles (56km) east of Thunder Bay. The site contains the largest deposit of amethyst in Canada. The mine currently produces 40 percent useable amethyst by volume, and has a large digging area open to the public that contains 20 percent useable amethyst. All visitors need is a bucket and spade to enjoy a fun mining experience.